In the past 24-hours there have been 5 new cases (2x Jiangxi, 1 Zhejiang, 1x Fujian and 1x Shandong) with no new deaths reported. This brings the total for China to 125-cases including 23-deaths and Taiwan to 1-case without loss of life. (It should be noted that I do not include the asymptomatic Beijing case in my count). To date 18.3% of all known cases have been fatal. For context the Case Fatality Rate of SARS was 10.9%. There were no confirmed discharges in the past 24-hours, thus the current count of recovered remains at 20 (15.9%). 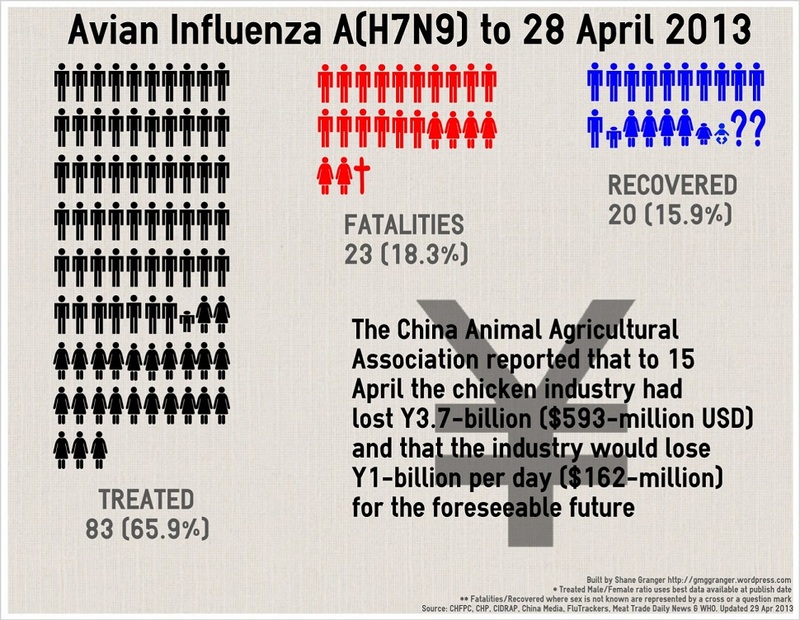 Note: Prior to today when a four year old was confirmed with avian influenza A(H7N9) all known paediatrics and children had recovered. The most recent fatality reported was on the 26th April 2013 via Jiangsu Health (in Chinese). If the China Animal Agricultural Association numbers are to be believed the chicken industry will ‘in the hole’ a further ¥14,000,000,000 or according to Xinhua’s calculations would have experienced around $2.273-billion in direct losses (feeding of chickens that no one is buying, culling of chickens, lost productivity, maintenance and loss of breeding stock). Xinhua reported that vegetable vendors are doing very well as customers change their purchasing habits to avoid chicken. I’d also suggest that the European breed stock owners will be doing very well once the crisis is over as it sounds like the Chinese will need to do a lot of stock rebuilding. Added another two cases (1x Fujian & 1x Shandong) which were reported by Xinhua at 23.55CET.